So it’s summer. It’s summer! Time for dinner on the deck, homemade ice cream, and if I’m lucky, good tomatoes. 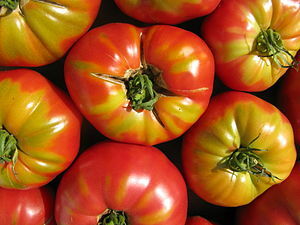 I stopped by the grocery on my way home tonight to pick up a few things and saw heirloom tomatoes were in stock. And like a magnet, pricey though they are, they drew me in. I put three luscious ones in my cart, and immediately, almost without conscious thought, my feet headed toward the bread aisle. When tomatoes are in season…and only home-grown or heirloom specimens are truly worthy…no anemic, plastic-looking hot-house varieties need apply…my favorite thing is a tomato sandwich. And that sandwich must be made with white bread. Can’t do wheat or oat bran or whole grain for this combo. I like hearty breads and brown breads and seeded breads. But as soon as tomatoes are in season, my tastes revert to childhood. And in my childhood, at least in my mother’s house, deep in the heart of Mississippi, the bread was always white. I’m a purist when it comes to fresh tomatoes. A perfect summer tomato needs a sprinkle of sea salt. And that’s it. Pair with soft white bread and a generous slather of real mayonnaise and you have a taste of heaven. Some people toast the bread or add lettuce. Not me. Nope. All I want is the simplicity of summer flavor combined with the texture from childhood memory. And the bonus? No heating up the kitchen in the middle of our SE Alaska heat wave, and dinner is on the table in five. Perfect! Perfection! I am just like you. The sun-ripened tomato must be laid on white bread with mayonnaise and salt. The result is a little taste of heaven. Well worth the cost at any price. And believe it or not, I stopped at a produce stand on the way home for – tomatoes! Yep – we are thinking alike.